Ross County manager Derek Adams beamed with pride after his side fought back to claim a draw against Hearts and continue their unbeaten run in 2013. "We've done exceptionally well and against a lot of good teams and we've picked up a lot of points over the last four games," Adams told BBC Scotland. "We've been very competitive and I'm just delighted with the performance levels of the team." 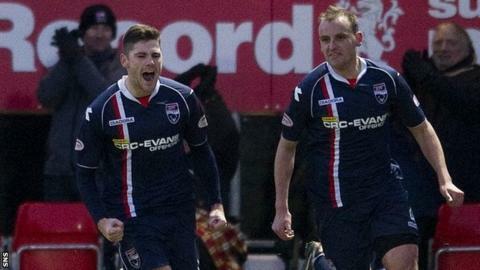 Despite moving 15 points clear of bottom club Dundee, Adams insists the threat of relegation remains. "Of course it is and it is not just for the teams in the bottom six but there's teams in the top six that'll be looking over their shoulder as well," he explained. "There's teams that are picking up points and we're trying to catch the teams that are above us and we've done that today. "We want to stay in the SPL, we want to move up and be successful." Adams made several signings during the January transfer window and the County boss feels the player pool has shaped up well for the rest of the season. "We've got a Swiss, a Greek, two Scottish boys, we've got a Canadian that can come in and then we've got a German up front," he added. "Into that, we've got some Englishman and Irishmen as well. "When you talk about money, the foreigners are fine but when you talk about running and hard work, then they go a bit deaf! "It's made us stronger as a group. We've moved on nine players, we've taken in five. We do look like a strong unit and we've got that togetherness that has taken us this far."